I thought, since Memorial Day was this weekend, I would try to find a recipe that would be great for a picnic, but also follow a patriotic theme. I looked around and found this salad that I thought would be perfect once I added a few ingredients. It’s a spinach salad with strawberries, blueberries and feta. Can you see where I’m going with the Red, White and Blue? Spinach is a great source of Vitamin C and A, and it is loaded with flavonoids, which act as antioxidants, protecting the body from free radicals. Plus we are adding strawberries and blueberries, which are also loaded with fiber, potassium, and Vitamin C. So this salad is not only delicious, it’s GOOD for you!! Whisk together balsamic vinegar and mustard, slowly whisk in olive oil until well combined, season with salt and pepper. I find it’s easier to put everything in a jar with a lid, and then I just shake well to combine. 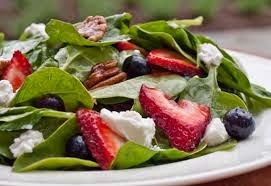 In a large salad bowl, combine spinach and lettuce (if using), strawberries, blueberries, feta and walnuts. Pour dressing over salad and toss well to coat.